In not the too distant past, driving into Richmond along Alderbridge towards Garden City Road would yield several constants. First, you will probably be cutoff before you reach the intersection. Second, you will be surrounded by white luxury SUVs on all sides. 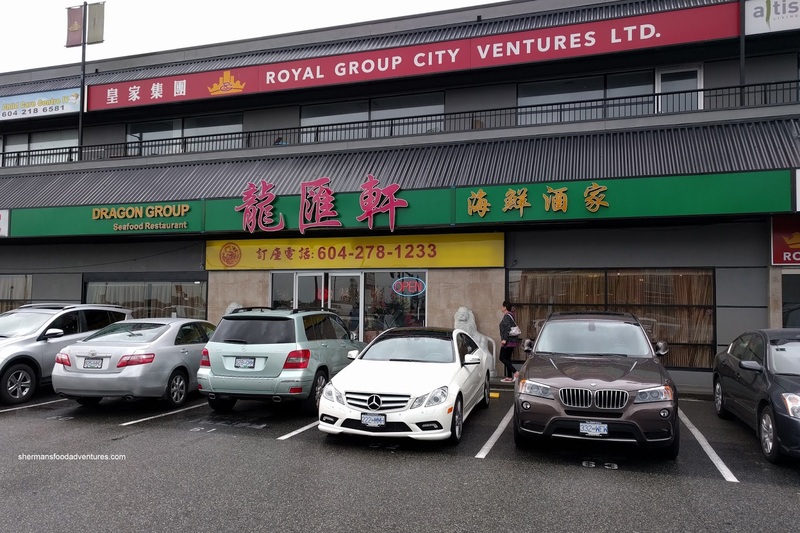 Third, you will see the familiar yellow signage of South Ocean Restaurant. But suddenly, it all changed. No, I still got cut off and was boxed in by white luxury SUVs as per usual, yet South Ocean was no more! 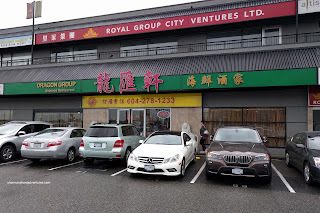 In its place, there is this new spot with an interesting name in Dragon Group Seafood Restaurant. Grace and I decided to check it out one day where we found that the divy decor of South Ocean has become classy and upscale. 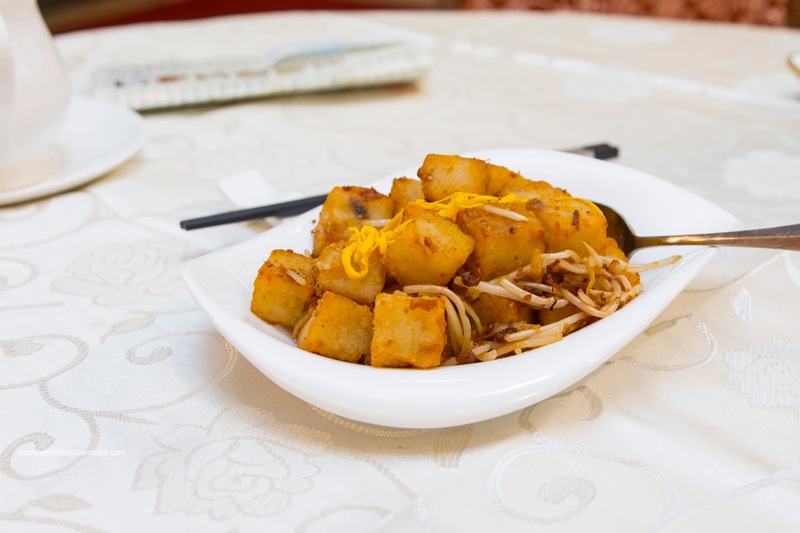 We decided to go big or go home, so we ordered 12 dishes to share starting with the Pan-Fried Daikon Cake with XO Sauce. These were lightly crispy, soft and not overly greasy. 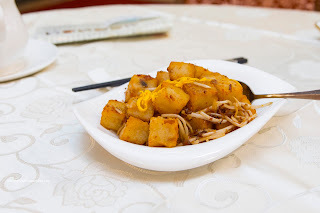 I found the amount of XO sauce was adequate in providing some aromatics and spice to the dish. Looking rather pale and goopy, the Spareribs with Pumpkin in black bean sauce were below average. I found the meat to be dense and chewy rather than the desired rebound texture. Due to the deep dish, the moisture and oil content was excessive which in turn created an overly wet product. In terms of flavour, there was some garlickiness, but the dish was fairly bland. 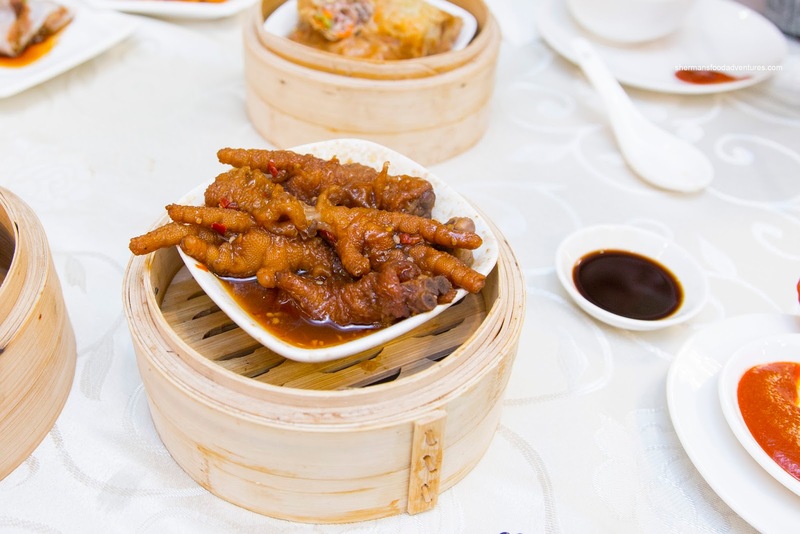 Another relatively average item was the Phoenix Talons (Chicken Feet) as most of the fried skin was separated from the bone. I found them to be scrawny and not plump, hence, there wasn't whole lot of anything underneath the skin. To complicate things, due to the deep dish once again, the whole dish was overly wet and greasy. This was not particularly appetizing nor aesthetically-pleasing. 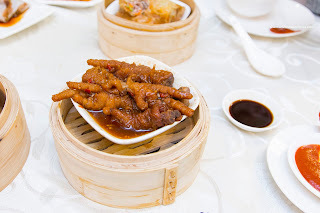 On the other hand, that also meant that each claw was completely seasoned in a garlicky sweet and salty manner. 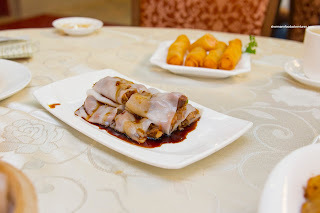 One of the better dishes was the BBQ Pork Rice Noodle Roll as it was super thin and texturally on point. The rice noodle was soft while retaining a balanced elasticity. Inside, there was plenty of lean BBQ pork that was moist and not dried out. 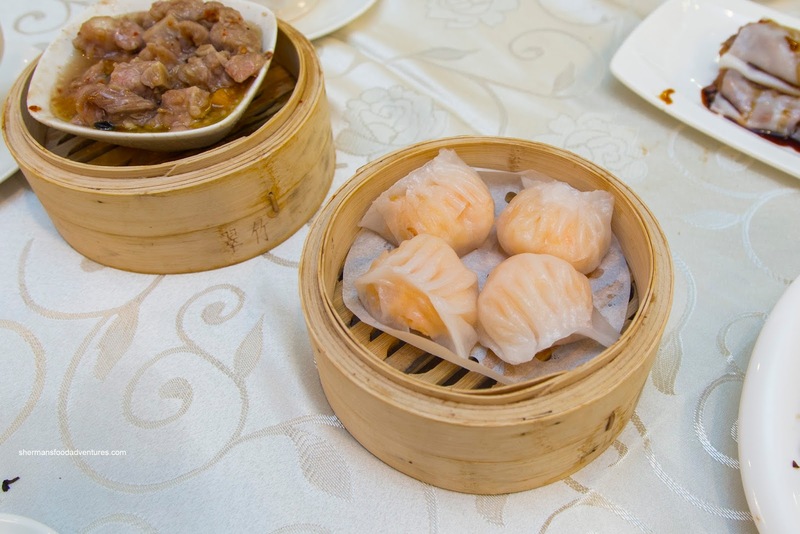 At first, we were concerned with the appearance of the Haw Gow (Shrimp Dumpling) as the skin was broken and seemingly oversteamed. Well, it actually was overdone where the dumpling wrapper was wet and slid off on contact. However, the fabulous shrimp filling saved the dish from a complete fail. Consisting of whole shrimp with barely any binding agents, the texture was practically perfect. 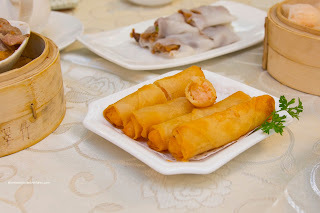 With a moist and buttery snap while aromatic and sweet from the sesame oil, the shrimp filling was one of the best I had of late. Topped with black truffle, the Siu Mai was a bit dense in texture. However, the pork still exhibited an appealing bounce texture and the whole pieces of shrimp were also on point. I know it is all the rage right now to put preserved truffle on dumplings, but I found this a bit overwhelming. Petite in size, the Deep Fried Taro Dumplings with duck in Portuguese sauce were texturally different than the typical version. 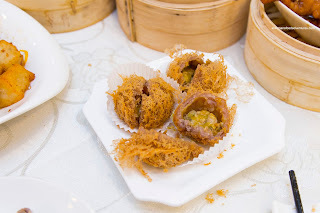 Since there was a super thin layer of taro puree, the exterior was far more crunchier and the dumpling lacked the usual richness of the taro. I found the filling to be quite nice though with lean chunks of duck bathed in a creamy and mild coconut curry sauce. Continuing with fried food, we had the Garlic Shrimp Spring Rolls. These were firmly crunchy and easy on the grease. 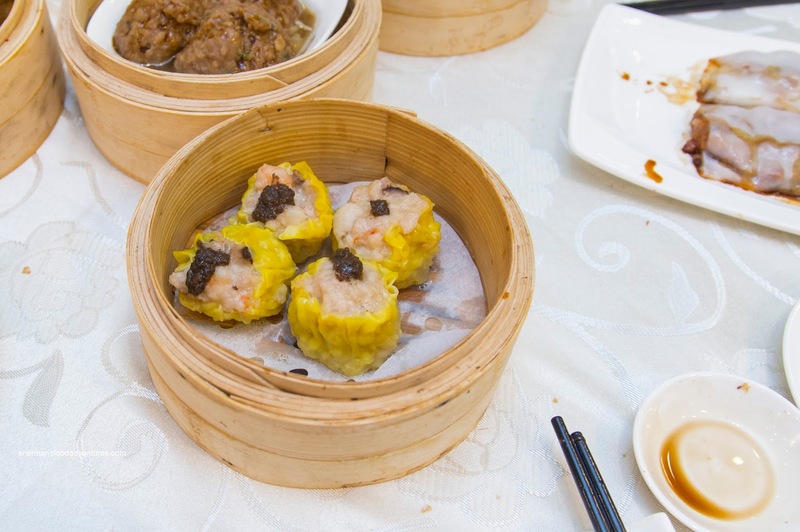 Inside, the whole shrimp filling was similar to the haw gow where it had a buttery snap. Moreover, there was enough garlic to make an impact. 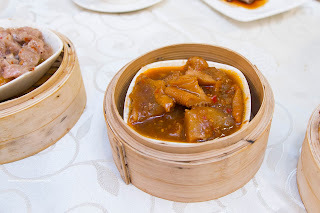 Onto the usual offal dish, we had the Steamed Tripe and Tendon in special sauce. I'm not sure what they meant by special sauce, but to me, it tasted like a mix of oyster sauce, soy and satay with plenty of sugar. Again, due to the deep dish, everything was pretty saucy. I found the tendon to be appealing soft while still retaining a bite that was gelatinous. 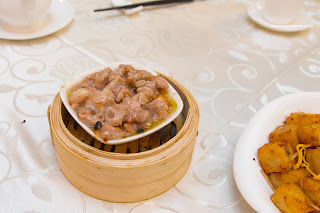 As for the few pieces of tripe, they were soft but still appealingly chewy. 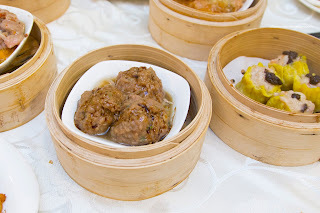 Also texturally on point were the Beef Meatballs. 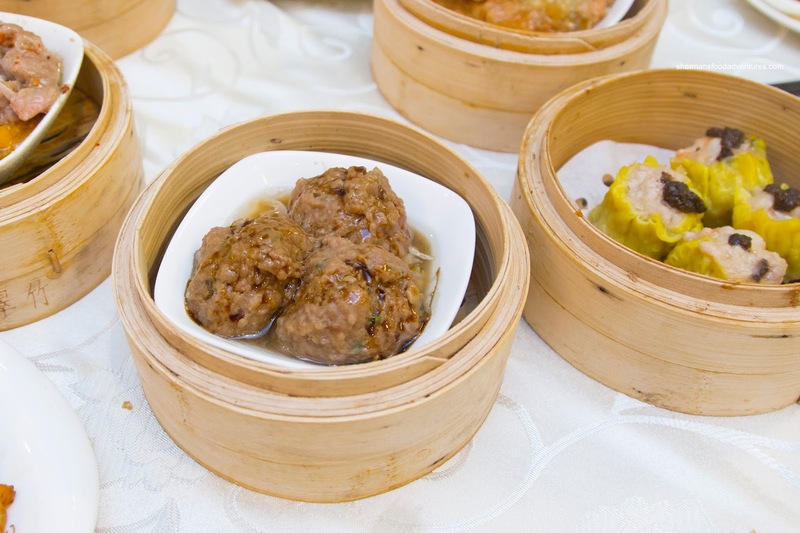 Bouncy with a meaty chew, the meatballs contained only a minimal amount of green onion. There was a noticeable amount of dried orange peel though. We found the Bean Curd Skin Rolls a study in textures where the carrots, celery and water chestnuts were super crunchy. Personally, I like any veggies in this type of roll to be a bit more cooked than what we got. On the other hand, it did provided a firm crunch to contrast the tender pork. Due to this, the roll tasted more like vegetable than meat. 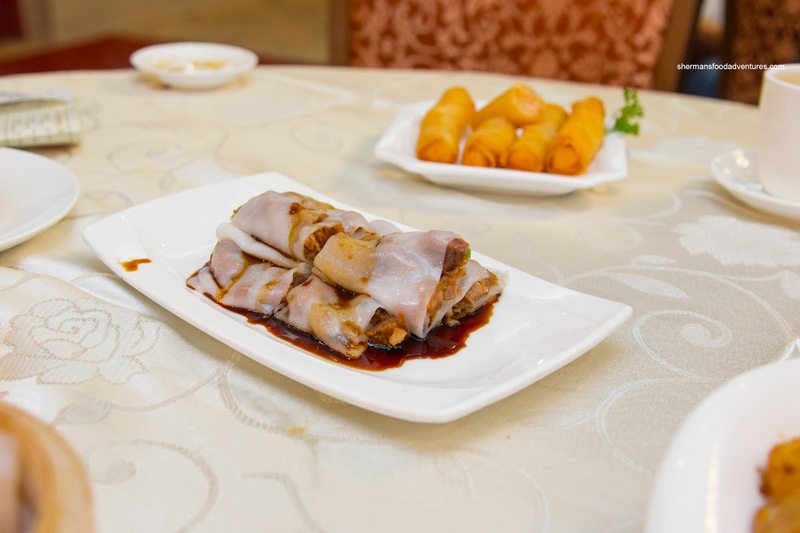 The thin layer of bean curd skin was soft with an appealing chew. Surprisingly, we were served the Egg Tarts last despite it being in our original order (they got that right!). I found the tart shell to be soft and buttery, but hardly flaky. 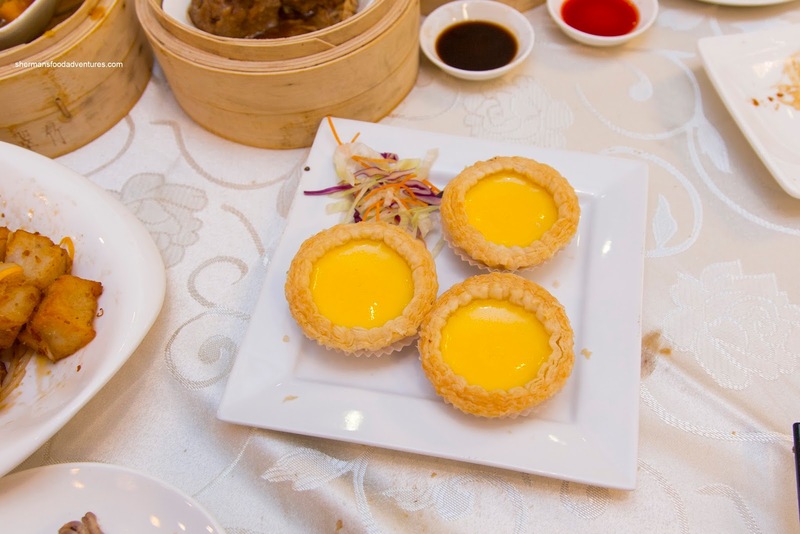 The egg custard was silky and medium firm in texture. It wasn't very sweet though which suited me just fine. Overall, the Dim Sum service was decent, yet with a few faults. 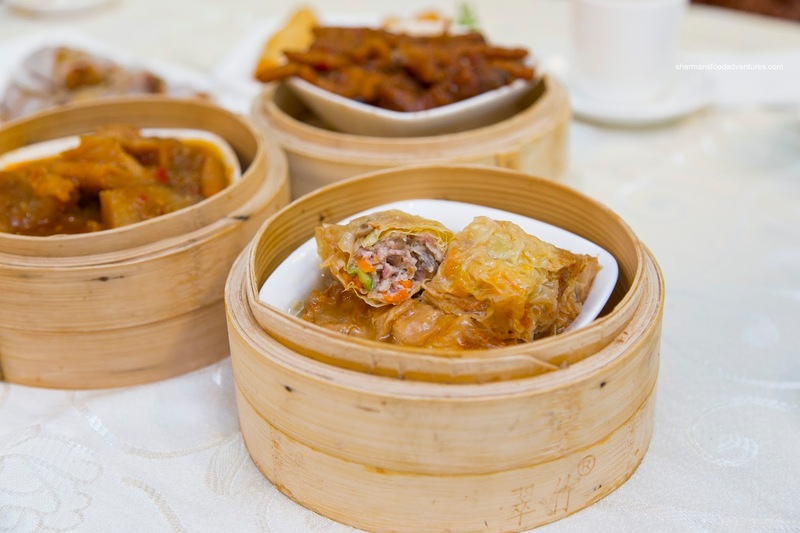 In particular, the deep dishes they use ensure that things get too saucy and wet as well as watering down the flavours. "No, I still got cut off and was boxed in by white luxury SUVs as per usual"
Hey let's count 'em ..... Q3/Q5/Q7, GLC/GLE/GLK and even the occasional G-Class, X1-->X6 (new & bigger X7 model coming in 2018), LRRR Evoque/Discovery. Did I miss any ?